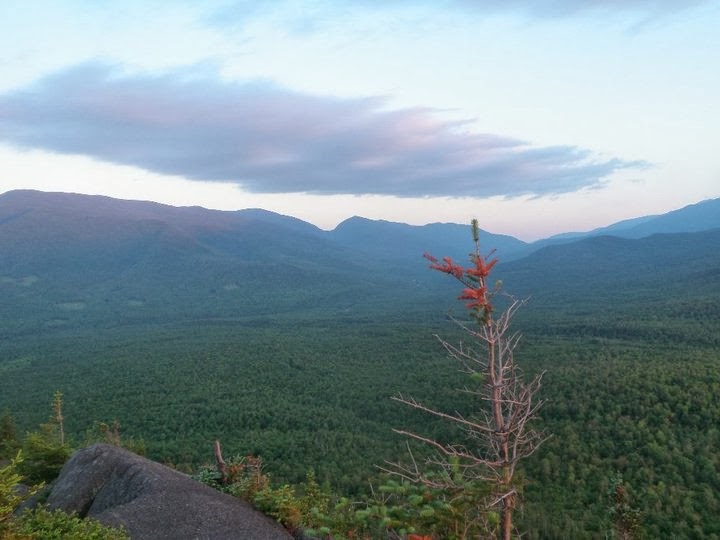 The Pine Mountain Trail from Gorham, NH was reopened in the 1990s to restore an abandoned section of the Pine Link Trail that once linked an old route of the Appalachian Trail (AT) with the Northern Presidentials. The trail is now designated with yellow and orange blazes, but you can still see some of the white AT blazes along the trail if you are looking close enough! (picture on right) The summit in the front in the picture above is Pine Mountain (2,405 ft) from the view on Chapel Ledge. This hike to the summit is 2.7 miles with 820 feet of elevation gain over moderate terrain. To access the Pine Mountain Trail is at the end of Promenade Street in Gorham. The views from the summit of Pine Mountain (pictures below) have fantastic views of the Northern Presidentials, Carter Notch, Wildcat and the Carter Range. 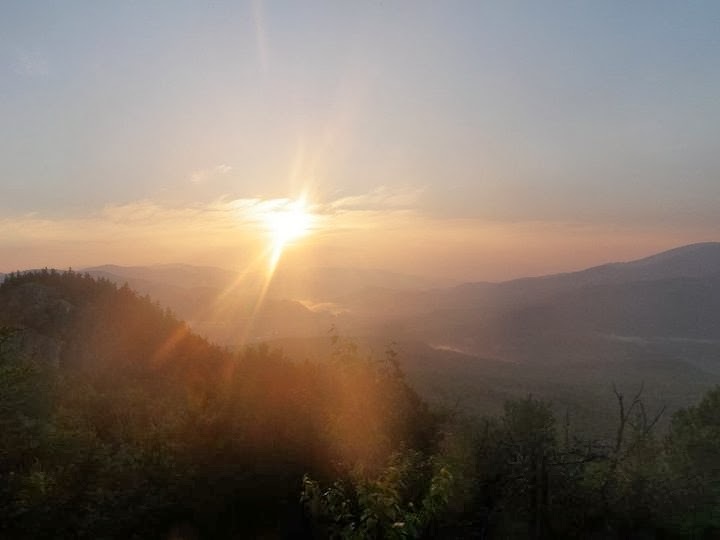 The picture above was taken this morning from Chapel Ledge, which you can access 2.2 miles from the Pine Mountain Trail, or 1.5 miles from the Pine Mountain Road. This is a quick 0.1 mile hike off of the trail, taking the staircase at the intersection. The way to access the Pine Mountain Road is from the Pinkham B Road (Dolly Copp Road) in the summer when this road is open to the Pine Mountain Road, the private automobile road to the Horton Center on Pine Mountain most of the way to summit of Pine Mountain which is a very easy walk down this road with an 800 foot elevation gain over 2.0 mi with a book time of 1 hour and 25 minutes. Please be cautious of automobiles that may be traveling down this trail. 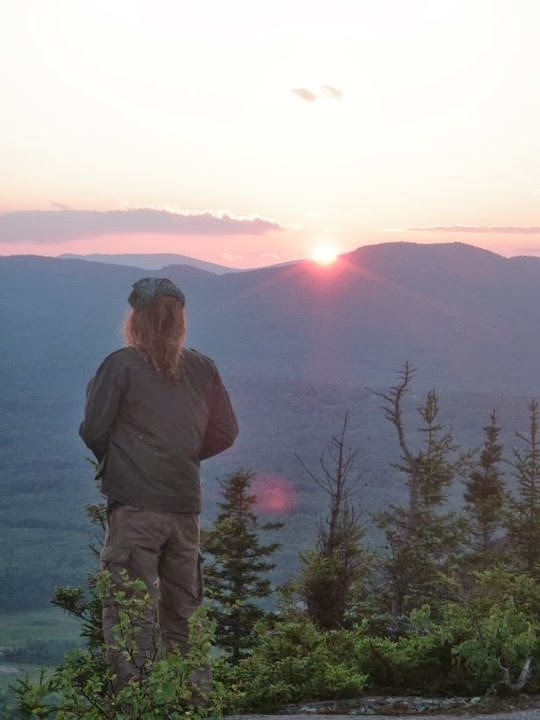 A few summers ago some friends and I hiked up to the Pine Mountain for a great sunset hike, as the western views looking past the Northern Presidentials make for some fantastic sunset views. We accessed this via the Pine Mountain Road as the Dolly Copp Road was open. The picture to the left is the views looking westward. The picture below is looking into Carter Notch, which has one of the best views into the notch in the White Mountains! This is also a great location to see the sunrise as the shelter has some fantastic views looking east (picture to the left). If you would like to reserve this shelter please contact the Horton Center to do so. This is a great 4 season hike, and both access points are very easy to find and well marked. In the summer the access from the Pine Mountain Road is a bit quicker than the Pine Mountain Trail. In the winter please keep in mind that the trail intersects with the snowmobile trail on the Pine Mountain Trail, so please stay to the side of the trail. The current trail conditions for most of the White Mountains require either flotation devices or traction devices depending on the amount of hiker traffic. Today on this trail snowshoes were a good choice as this is a less traveled trail and is not well packed down. Trails around Pinkham Notch are well traveled and light traction devices are reccomened. However with the forecast of snow over the weekend and middle of next week these conditions may change so please call us here at Pinkham Notch to get the up to date trail conditions report. If you are headed into the ravines or in avalanche terrain please make sure to read the avalanche board here at PNVC, it will be updated daily as well as the Mount Washington Avalanche Center conditions and advisory report which is compiled daily by the United States Forest Service Snow Rangers. These advisories are updated usually between 8am and 9am. There is also the Mount Washington Valley Ice Fest in North Conway this weekend which is a great resource for climbing and mountaineering information as well as clinics, demos and slideshows from world class climbers and mountaineers! The AMC also offers and hosts clinics and group trips for snowshoeing, ice climbing, avalanche certifications and winter mountaineering. All of our programs for the '13/'14 season can be found on our Activities and Events Page. For any general questions, conditions information, or trail advice, please feel free to contact us here at the Pinkham Notch Visitor Center front desk. We are available by phone at (603) 466-2721 every day from 6:30 AM to 9:00 PM or by email at amcpinkhaminfo@outdoors.org. To make reservations at AMC Lodges and Huts, please call (603)466-2727 available Monday through Saturday 9am-5pm. We also offer ski and stay packages at our Joe Dodge Lodge and the Highland Center.